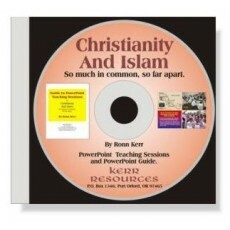 This new CD Rom contains all 359 PowerPoint Teaching Frames -- animated text frames, photographs, maps, and charts to help in teaching the thirteen chapters of the Christianity and Islam study plus the 56-page PowerPoint Teaching Guide in a pdf file ready for local printing. The PowerPoint shows can be shown on any computer whether or not it has PowerPoint software on it. Author Ronn Kerr has taught this course many times and he finally decided that it would be made much stronger with a PowerPoint program filled with pictures, animated text frames, maps and charts divided into thirteen shows that match the thirteen chapters of the Student Book and Leader's Guide. In addition to the PowerPoint Teaching frames, the supporting 56-page PowerPoint Teaching Guide is on the CD Rom in both a color and grayscale version with pictures and commentary about each frame of the thirteen PowerPoint shows. Christianity and Islam by Ronn Kerr is a unique new study for a unique time. Each session covers a major area of the world's two largest religions, comparing and contrasting them in a way that brings greater understanding of each. Written for Christian adults and older youth that have little knowledge of Islam other than what they have seen in the news, this study aims at providing a general understanding of the differences and similarities between these two great religions. This thirteen-week course is a perfect substitute for those quarters when dated studies like the International Lesson Series just don't work. When that time comes, try Christianity and Islam and then return to the dated studies the next quarter.